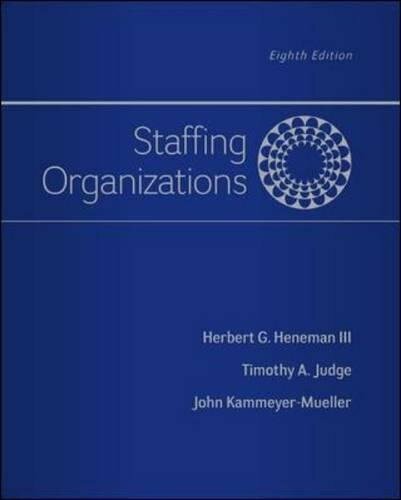 77862414 -Heneman&#39s and Judge&#39s Staffing Organisations, 8e, is based on a comprehensive staffing model. Components of the model include staffing models and strategy, staffing support systems (legal compliance, planning, job analysis and rewards), core staffing systems (recruitment, selection, and employment), and staffing system and retention management. Up-to-date research and business practices are the hallmarks of this market-leading text. In-depth applications (cases and exercises) at the ends of chapters provide students with skills-building and practice in key staffing activities and decision making. A comprehensive running case involving a fictitious retailing organisation provides even greater opportunity for in-depth analysis and skills-building. Students also have the opportunity to address ethical issues at the end of each chapter.